Author(s): Venkata Srikanth Meka, School of Pharmacy, International Medical University, No. 126, Jalan Jalil Perkasa 19, Bukit Jalil, 57000, Kuala Lumpur, Malaysia. Venkata Ramana Murthy Kolapalli. 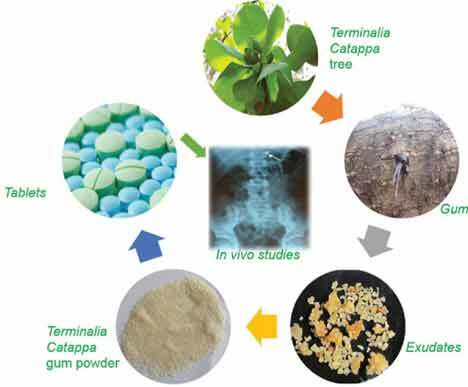 A central composite design was applied to design a novel gastric floating drug delivery system comprising propranolol HCl in Terminalia catappa gum and to evaluate the buoyancy, in vitro drug release behavior, and pharmacokinetic parameters. All formulations exhibited good buoyancy properties in vitro reflected by floating lag time of 1-110 sec, total floating time of 9-16 h and prolonged release behaviour (upto 12 h). Statistically optimised formulation (PBGRso) was orally administered to human volunteers under both fasted and fed conditions to evaluate gastric floating behavior under different food conditions by X-ray evaluation. In vivo studies of optimised formulations revealed that the gastric residence time of floating tablets was enhanced in the fed but not in the fasted state. Pharmacokinetic studies of the optimised Terminalia catappa formulation and a commercial product (Ciplar LA 80) carried out on healthy human volunteers showed a significant improvement in the bioavailability (132%) of propranolol HCl released from from the experimental Terminalia catappa formulations compared with Ciplar LA 80. Keywords: Buoyancy, central composite design, floating drug delivery, in vivo studies in humans, propranolol HCl, Terminalia catappa. Affiliation:School of Pharmacy, International Medical University, No. 126, Jalan Jalil Perkasa 19, Bukit Jalil, 57000, Kuala Lumpur, Malaysia. Keywords:Buoyancy, central composite design, floating drug delivery, in vivo studies in humans, propranolol HCl, Terminalia catappa. Abstract:A central composite design was applied to design a novel gastric floating drug delivery system comprising propranolol HCl in Terminalia catappa gum and to evaluate the buoyancy, in vitro drug release behavior, and pharmacokinetic parameters. All formulations exhibited good buoyancy properties in vitro reflected by floating lag time of 1-110 sec, total floating time of 9-16 h and prolonged release behaviour (upto 12 h). Statistically optimised formulation (PBGRso) was orally administered to human volunteers under both fasted and fed conditions to evaluate gastric floating behavior under different food conditions by X-ray evaluation. In vivo studies of optimised formulations revealed that the gastric residence time of floating tablets was enhanced in the fed but not in the fasted state. Pharmacokinetic studies of the optimised Terminalia catappa formulation and a commercial product (Ciplar LA 80) carried out on healthy human volunteers showed a significant improvement in the bioavailability (132%) of propranolol HCl released from from the experimental Terminalia catappa formulations compared with Ciplar LA 80.